Baling textiles or food containers is a breeze with this Food Can & Textile baler. Many textiles are recyclable including bed linens, towels, and clothes. In order to transport large quantities of textiles, baling has become a necessity. This baler will compact your textiles into an extremely compact and easy-to-transport baled cube. Containers and cans that food has been stored in usually must be compacted and baled in order to save space in back rooms of kitchens, cafeterias, schools and other facilities, saving space, money and in many cases making income from recycling the cans and containers. 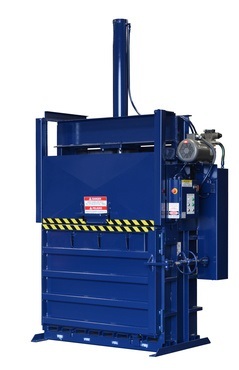 This 60" Extra High Density Baler is Ideal for Facilities (such as Correctional Facilities) that are processing a large amount of # 10 Food Cans as well as those who are wanting to bale clothing / textiles where the volume does not warrant a conveyor and automated rear chute. 60V-2748 Product meets or exceeds all ANSI Z245.5 and OSHA standards. A = 68" B = 80" C = 54" D = 108" E = 143" F = 55" G = 102" H = 76" I = 54"